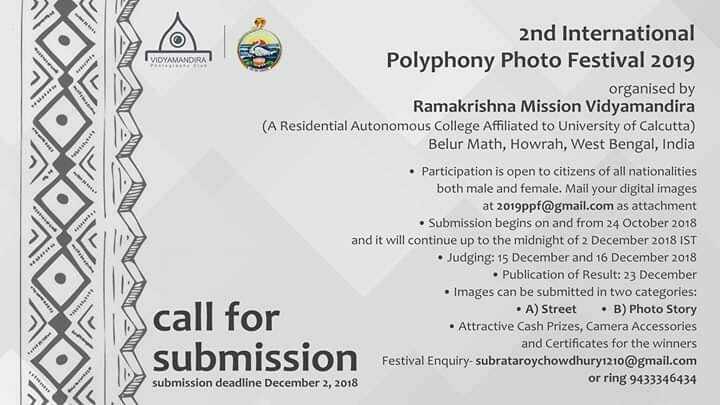 2nd Polyphony International Photo Festival 2019 invites you to explore the word border in its widest connotations. We have been drawing borders from the day we started to seek power and exert authority. If there are people drawing lines of demarcation, the other humans challenging this notion of human borders stand by their side. This year’s theme is about showcasing the stories of these others. Whether they are borders on economic, geographic, political, religious, and racial lines or borders in gender or beliefs, every time there is a boundary someone will try to break it down and restore our faith in humanity. We look forward to the celebration of this spirit in the photo stories that you will submit. PRIZE DETAILS: Cash award/ gift vouchers/ camera accessories Not eligible to enter? - Find contest where you are. Organizer reserves the right, in its sole discretion, to disqualify any entry that does not comply with any of the above, even after the entry is submitted on the competition website. Festival organizer respects photographers rights and does not claim copyright over images submitted to this contest, you the author retain full copyright in each entry. Failure to publish a credit due to error or oversight shall not be deemed a breach of this condition. USAGE RIGHTS: By entering this contest you agree that any winning or short-listed/finalist images you submit may be used by the festival organizer solely for marketing and promotional purposes of this contest or future contests and no other purpose, these uses include; displaying the entries on the contest website, promotion of the contests and the photographers, cropping and re-sizing the image as necessary to fit pre-defined formats for the competition. 2. You acknowledge your responsibility for protecting your entry against image misuse by third parties, by, but not limited to, the insertion of a watermark, retaining exif data. Festival organizers and its sponsors can assume no responsibility and are not liable for any image misuse. 3. Should any image uses beyond those needed for the contest arise you will be contacted and given the opportunity to negotiate any such usage with the parties concerned independently of the contest.